Little S loves bandhakopir tarkari or cabbage sabzi. Only she calls it "Baba Kopi". This makes us laugh because "Baba"=Dad in Bengali. She does not like Fulkopi or Cauliflower as much as "BabaKopi". Also she refers to Cauliflower as "White Broccoli". And then she calls Swami Vivekananda -- Ferdinando. Otherwise her Bengali is impeccable. The Dalna in Bengali Cooking is a gravy dish where the gravy is thicker and richer unlike a jhol where the gravy is soupy and runny. For evey jhol there is an equivalent Dalna. So if there is a Alu-Kopir jhol there is the Alu-Fulkopir Dalna, for a Alu-Potol er Jhol there is an equivalent Alu-Potol er dalna, so on and so forth. The Dalna can be Niramish, which means vegetarian with no onion or garlic or can be Aamish with not only onion and garlic but sometimes fish being added to it. Also almost always dalna has a phoron of Whole Garama Masala and is cooked in Ghee or White Oil but it might vary a little amongst families. I made the Alu Potol er Dalna yesterday after years. 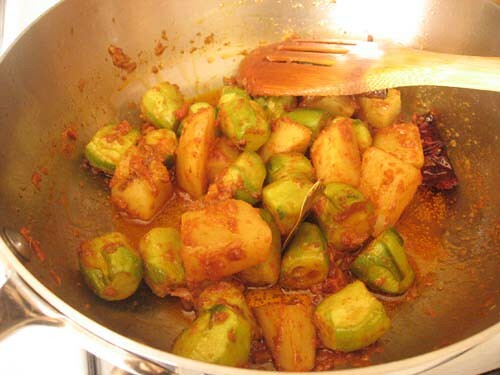 Potol/Parwal or Pointed Gourd is a summer vegetable back home. No one pays much attention to it after first few days of its arrival in the summer market. After that it is just one more staple summer veggie. Here Patol/Parwal is expensive, not in its best form and seen occasionally in the Indian Grocers. Me buying Patol is same as someone buying Celery sticks in the heat of Mumbai.Does not make a whole lot of sense except for making mundane Potol a very fancy vegetable for me and cooking it as a special Sunday meal. I made a Niramish Alu Potol er Dalna, no onion to chop always tips the scale for me. We really enjoyed it with some Rice and for once did not miss the mandatory meat or fish that is on the Sunday lunch menu. 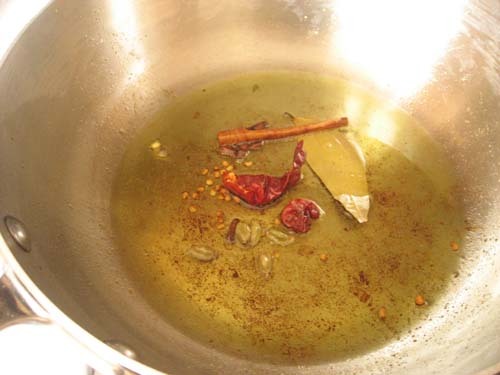 Heat White Oil in a wok and fry the potol with a pinch of turmeric till they are a pale golden. Remove with a slotted spoon and drain on a paper towel. Note: I roast corriander seeds and grind them to a fine powder. Ditto with Cumin Powder. My Ma however uses jeere bata or cumin paste in this recipe. You can do that too. I also use Kashmiri Mirch so use Red Chili Powder according to taste. Add the lightly fried poto/parwal and gently mix everything together. Add 1 cup of warm water. Add salt to taste. Cover and cook till potatoes are done. Potol/Parwal should be done by now. Remove the cover and reduce the gravy to your desired thickness. Add about 1/4 tsp of sugar for an authentic Bengali taste. 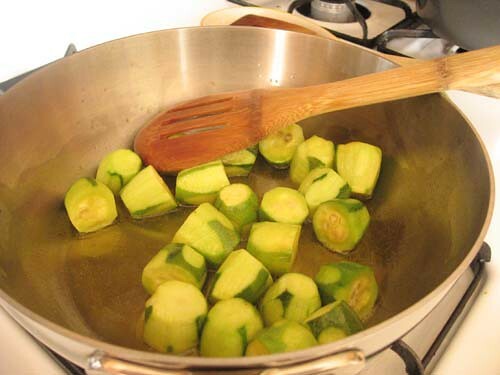 1st I am going to try this recipe on Fulkopi , then on the staple summer vegetable patol. I like it . I take note of using roasted coriander powder, which I have never used before. Tomar boudi-ke ghum theke tul-e tomar pathano complement ta debo bhab-chhiam..suddenly good sense prevailed ..tai tomorrow morning.. Most store bought spice powders have very less smell and taste. It is mainly because of dry grinding and over heating..Traditionally all spices were wet ground and there is no heating..so the flavor used to be great. Once in a while when I cook to reproduce some recipes of my Mom, I use wet ground spices..it makes lot of difference. I think I will also try roasted jeera powder and see how it tastes. this is very new for me!!!!! Ferdinando? Falling off my chair (bed) laughing! Potol kono din jomlona. Even as rui maacher dolma which Didu would make. This looks soo delicious! You are making me hungry in the middle of the afternoon! 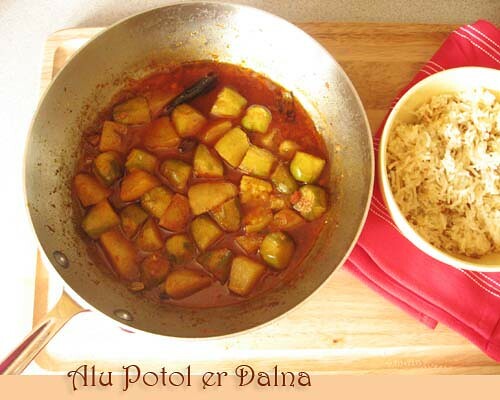 Alu Potol is still one of my favorite dishes! Love the looks of that fiery Alu Potol. I have seen this vegetable occasionally in the Indian store but never knew what to do with it. Ferdinando?! Hilarious! Yummy looking curry. Another for my recipe file. Ferdinando? any spanish influence for the little one? OH, I just cooked it a couple of days back and was thinking of putting it up in our blog. Looks yummy!! 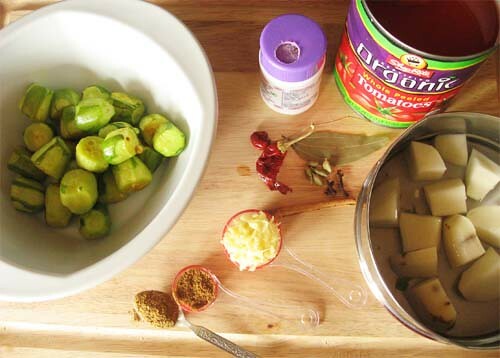 My Grandma used to make parmal curry - it was delicious!! 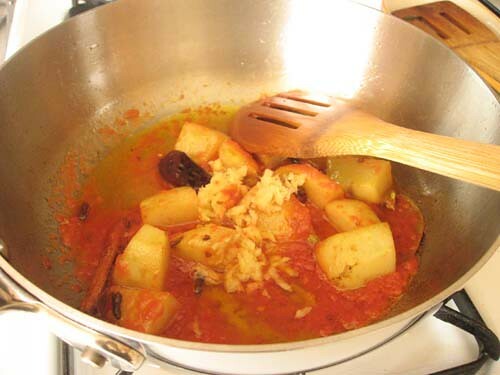 Now that i know a jhol from dalna...i always loved this curry with a peculiar peeling pattern in bengali families . Have tried it only once . You recipe makes me think of making it again. FYI ..i grow a lot of celery here in Delhi and this is the only herb growing happily in my garden , all the others are snooty n demand a lot of care. Potol can also be grown successfully from stem cuttings , once it starts growing you can't tame it . Then you would have a lot of potol to make even the parval ki mithai . I tried potol for the first time a few months ago and loved it. This curry with potatoes sounds (and looks) GOOD! You have not mentioned the quantity of patole required to prepare the dish. i love potol, specially the ones you get just at the beginning of summer, which have very ten der seeds. the dalna looks lovely. i have made it a few times, though i went light on the dhone and very little aada bata. the pics taken by you s delicious. i can almost taste it. with rice it will be yummy. hand crushed tomatoes will give a better taste than puree i feel. Yum! I can feel the seeds crunching in my mouth as I sit at my desk in the morning. Why are Potols always peeled stripey? Baba- kopi, will never be the same! My mouth is watering in the office! Baby S is so clever... Mini Basu looks at me like I am mad every time I speak in Bengali!! I've tried making a paste of soaked jeera and failed miserably ... so dry powder works for me best. Dalna ta dekhe khide peye gelo. Next time hing diye try korbo. And I wonder what's anon's prob. Looks delicious. What is potol in English? Will this taste as good with lesser oil? We don't usually add that much. Any suggestions? patol aar patoler dalna amaar kaachhe, baar baar i special, specially after being out of Kolkata for long 13 yrs. But amm still rolling in laughter over babakopi and white broccoli. But definite winner is Ferdinando....Pls give her a BIG BIGGER BIGGEST hug from me. Potol was not something I liked either, ekhon shob i bhalo lage. Do you get parwal where you live ? Yeah grandmas are the best, no ? The oil is on the high side, I agree. These dishes do taste good with more oil but you can lower the amount as per your preference. But the amount is definitely not enough for 10 ppl :) and also it depends on what you are cooking for those 10 ppl. The oil can be lowered according to your pref. More definitely makes it a bit more tasty, would use more if cooking for guests or once-in-a-while lunch. For regular lunch/dinner I would go with less. Kolkatay daily patol paoa ta ato sahoj, ekhane bose bose tomader patol samparke taan andaj kora muskil. tomar meye ra khub bhalo, tai patol ba badha copi bhalo base. amar 4.5 yr old son broccoli k kichudin age bolto green phulcopi! I suggest tumi patoler dolma ar patoler morobba blog karo. darun jombe! Oh my gosh, I love the renaming of Swami Vivekananda as Ferdinando!! Thinking of this will give me a special extra pleasure next time I listen to our CD of the aroti (sp?) sung at the Sri Rama Krishna Temple. Funnily, in the intro to that CD, someone says that the songs give an insight into Vivekananda's personality, but the speaker was slowly relishing the word 'personality,' and my husband, mishearing it, said to me, "That's an odd phrase - Vivekananda's 'terse humanity!'" So now we know it is actually Ferdinando who has the terse humanity! 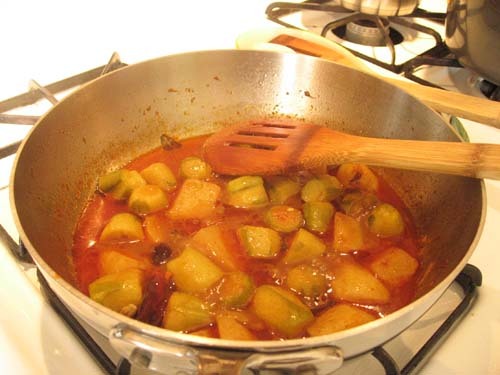 The aloo potol looks great. I hadn't had potol before our last trip to Kolkata, and I really liked it. Sottiy bolecho, dehse thakte potol ektu o bhalo lagto na !!! What CD is that and what kind of songs ? Hi Sandeepa! The CD is a recording from the evening service at Belur Moth temple. It's extremely nice - it is a cycle of songs composed by Vivekananda. They sing them at the Ramakrishna missions, with everyone participating and harmonium accompanying. I think ours is a copy from something of my father-in-law's - probably at Belur Moth they make the CD and he got it there and burned a copy for us. Maybe it is possible to find here too since Belur Moth is pretty famous? Thanks for this recepie, I made it today and it turned out quite fine. As i am the only one eating it, i guess the feedback would be a bit biased. I love your dalna......We cook the same way but have never put Dhone / coriander in it. Only cumin and ginger and ofcourse a little ghee and garam masala. Your anecdotes and recipes are fantastic. I enjoy reading them and feel like trying it out. I live in sunnyvale, CA. Can u or anyone tell me where I can get the actual big potol? All I get here is from India cash & carry and they are frozen and very small. I live in sunnyvale, CA. Can u or anyone tell me where can i get the real big potol? What I get here from India Cash& Carry are very small and frozen. gr8 recipe without onion and garlic... looking forward to some more! gr8 recipe.. without onion and garlic..looking forward to some more! 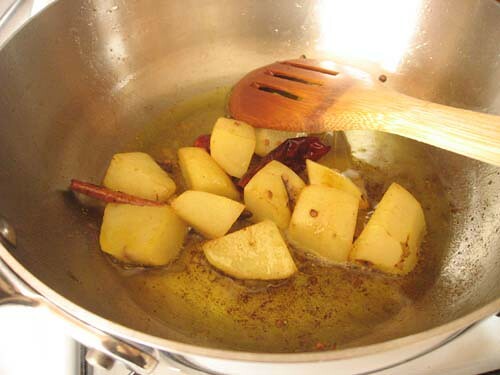 one question... the masala has to be prepared in a different pan and then alu and potol has to be addaed??? 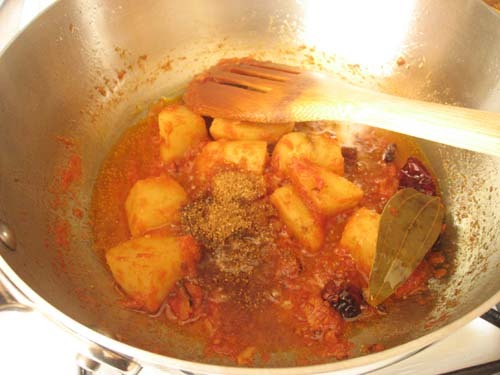 or the masala has to be added in tha same kadhai which already has the alu and potol???? Just follow steps as written. 1. Fry potol. remove and keep aside. OMG!!!! This recipe is incredible! Reminds me of home cooked meals in Cal as a child. Thank you so much for posting this. Thanks for clarifying the difference between Dalna and Jhol! I would always fuss when ma made potol. Then when I went home for the first time after 2 years in grad school in the US, I stopped overnight at my cousin's place in Delhi. I was so delighted to eat potol bhaja that night. I mean I had missed potol. Who knew that was even possible!